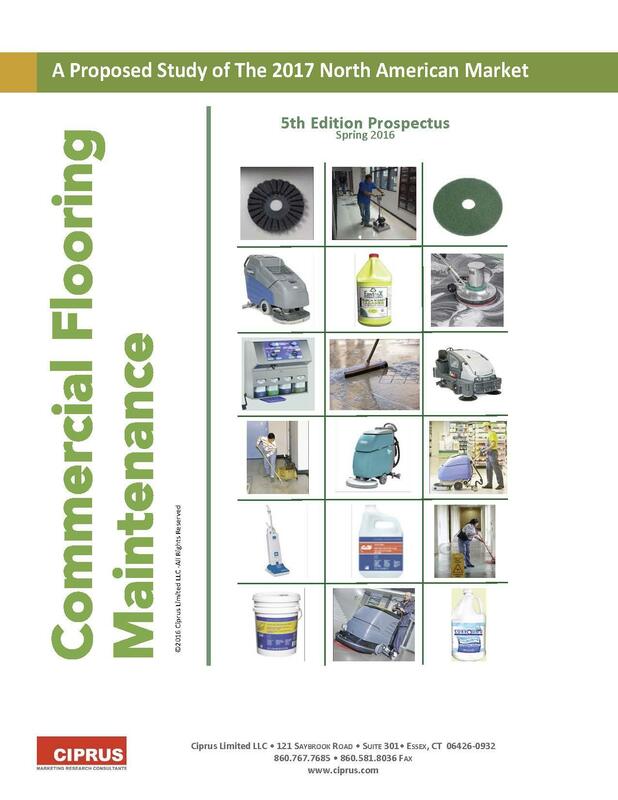 2017 North American Market for Commercial Flooring Maintenance - 5th Edition Ciprus Limited LLC is pleased to announce the completion of the 5th Edition of the North American Market for Commercial Flooring Maintenance. Orginally published in 1999, the 5th Edition has been completely redesigned with a focus on maintenance in 7 end-use marketsby size in both the US and Canada. The research consisted of 1,400 highly detailed interviewswith flooring maintenance decision makers as well as Building Service Contractors. Sixteen flooring surfaces were included in the research. The report is over 2,300 pages of highly detailed information on maintenance labor, consumables and equipment used. 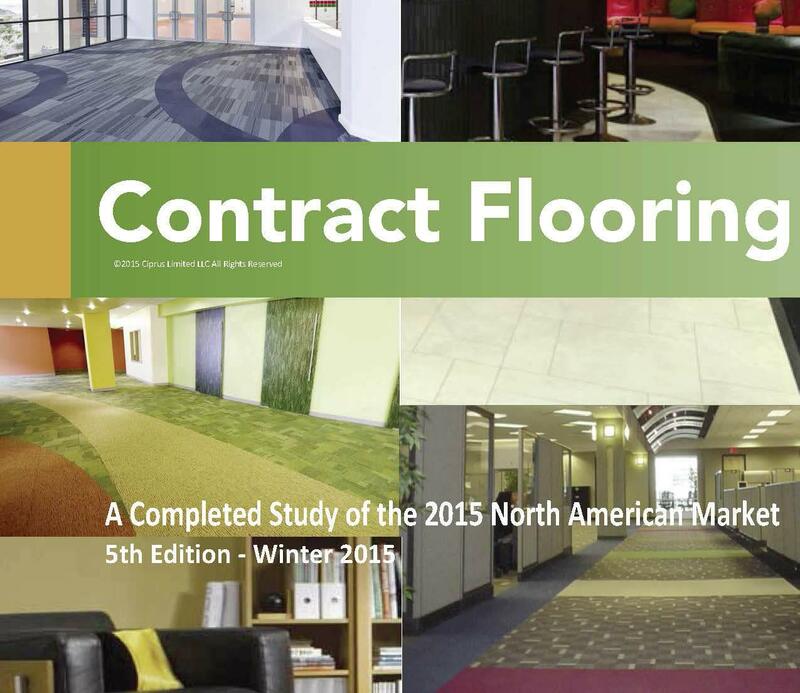 2015 North American Market for Contract Flooring Ciprus Limited LLC is pleased to announce the completion of the 5th Edition of the North American Market for Contract Flooring. The original research published in 1991 was followed by the second edition in 1996, a third in 2000, and the fourth in 2006. The research will target 18 flooring surfaces; vinyl sheet, linoleum sheet, rubber sheet, vinyl tile, linoleum tile, solid vinyl tile, luxury tile rubber tile, carpet, carpet tile, concrete unfinished and polished, stone, terrazzo, wood factory finish, wood site finish, laminate and ceramic tile. 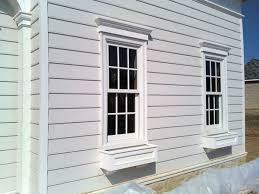 2012 Builder Decision Analysis for Exterior Residential Trim offers comprehensive insights as to who is the ultimate decision maker in the choice of trim as well as what factors are important to builders in a statistical survey among 480 small, medium, large and mega builders in the U.S. The report provides a thorough review of the decision making process for all leading types and brands of synthetic and primed branded wood trim installed in starter, move-up and luxury homes by region. The completed research report is 733 pages. The 2017 Builder Decision Analysis for Exterior Residential Trim The 2017 Builder Decision Analysis for Exterior Residential Trim 3rd Edition offers comprehensive insights as to who is the ultimate decision maker in the choice of trim as well as what factors are important to builders in a statistical survey among 480 small, medium, large and mega builders in the U.S. The research provides a thorough review of the decision making process for all leading types and brands of synthetic and primed branded wood trim installed in starter, move-up and luxury homes by region. Charter Subsctibers had input into the questions posed and the sample plan. 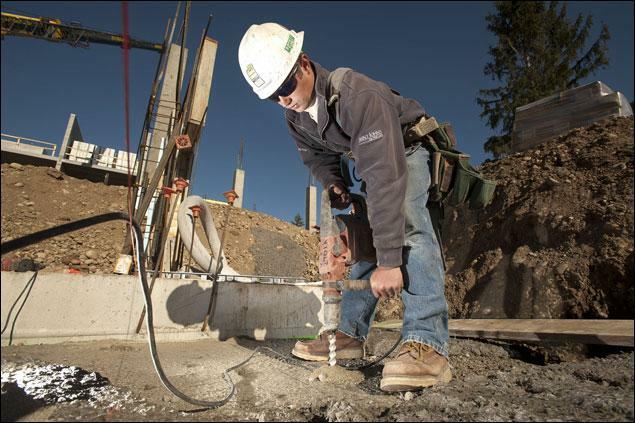 2016 North American Market for Professional Power Tools The 2016 Report provides a thorough review of 19 professional power tools including cordless and corded drill drivers, hammer drills, impact wrenches, nailers, recip saws, circular saws, jig saws, portable band saws, grinders/cutoff tools and combo kits. The research study tracks the purchases in units and by brand as well as by 14 sales channels by 7 contractor types,4 contractors sizes in the U.S and 3 sizes in Canada and Mexico as well as 4 U.S. regions. Charter Subscribers had input to the study design and sample plan. 2015 North American Market for Professional Power Tool Accessories tracked the annual purchases of 15 power tool accessory categoriess in units by brand and by 14 sales channels by 7 contractor types, and 4 contractor sizes in the U.S and 3 sizes in Canada and Mexico as well as 4 U.S. regions. Two key results of the research includeed the Incidence of Power Tool Accessory Purchases and the Per Capita purchases. 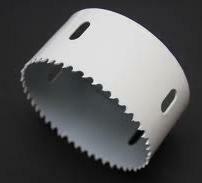 Additional data included motor technolog, battery size, blade diameter, Made in America as well as purchase attributes. The completed report contains over 2,430 pages of detailed graphics and matrix format tables and analysis.